Now that Evan has made his debut, I thought it is good timing to post an update on the little dude’s kidney diagnosis. As I have posted before, at our 20 week anatomy scan, it was determined that he has a multicystic dysplastic kidney (MCDK) on the left side, and slight hydronephrosis on the right. In layman’s terms, MCDK means that the kidney didn’t form correctly in that 10-20 week timeframe and was collecting fluid in multiple cysts around the kidney itself. It is irreparable and you hope that the other kidney is good enough to pick up the slack. Around six months in to my pregnancy, we had another ultrasound that showed marked improvement and the specialists pointed to hydronephrosis. Hydronephrosis is excessive fluid collection in the kidney due to some kind of blockage or deformity in the ureter that goes to the bladder. This is highly curable, and frankly, Ava had it and it cured itself almost immediately after birth. Luckily, it looks like we are on that same path. This beautiful little boy arrived on July 21. I will write about that day another time, as that is a story in itself. 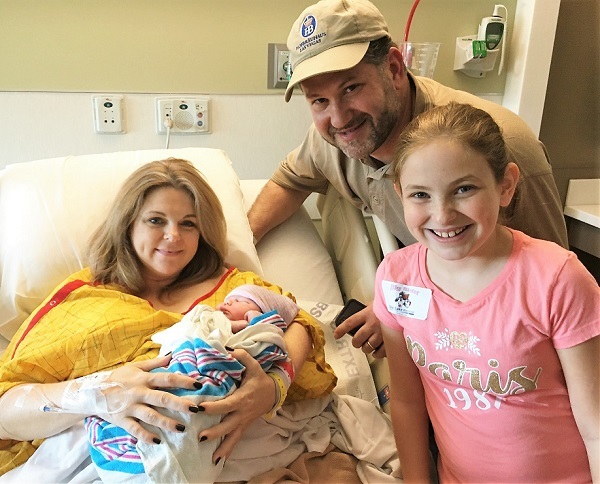 Evan had his first kidney ultrasound within hours of delivery. We were so preoccupied with loving the little guy that once the test was done, we didn’t pry to get the results too quickly. Or maybe we just didn’t want to know the results. Either way, when the pediatrician came in the next morning to discuss his health, we braced ourselves for the worst. I was too shocked to cry. I just sat there in that bed, paralyzed by a combination of my epidural and the shock of what I had just heard. Our gorgeous little guy will get to be on a much different path that what we had prepared to deal with. Since that day, he had an ultrasound around his one month birthday. Again, this showed no cysts and level 1 hydronephrosis. His only treatment for now is a mild, daily antibiotic and routine ultrasounds to follow up on his progress. We have our next ultrasound at his four month milestone and I’m anxious for more positive results so we can get him off of this antibiotic. We are so thankful that things have evolved the way they have. For the past 11 weeks we have been able to focus on him eating, pooping and sleeping like any other healthy baby. There is no longer any dread around doctor’s appointments or fear of what’s to come. I know our little guy is lucky and I know that so many other babies out there will not experience the same diagnosis. My heart goes out to those parents who do have to deal with MCDK for the long term. While it is scary, it is definitely manageable. Thank you to everyone who helped us through this experience. All of your prayers, thoughts and mojo surely had to have some hand in all of it. I’m convinced that there is something to the power of positive energy and I’m forever grateful for all that we have been given. Evan is gorgeous, and his hair would make Ron Burgundy jealous. Came across your blog through Instagram as I’ve been searching all sites trying to find other moms that have been in my shoes. I found out two weeks ago at my 20 week scan that our baby boy has a MCDK right kidney. We are feeling all of the emotions you’ve described and are just on the road to the many tests, extra ultrasounds and appts. With specialists. Like you, we had the genetics testing at 11 weeks and everything was perfect, and everything else looks perfect on the ultrasound besides that kidney. I can only dream of an outcome like yours, but am educating myself on what life with one kidney will be like for baby boy. Thanks so much for sharing your story! I too went through this with my son. Dr saw MCDK at 24 weeks utero. The cysts never cleared and after several tests his body started to dissolve his kidney. I now have a healthy 9 yr old boy who is excited about life, smart and not a fan of contact sports! Totally fine with him by the way he’d rather play video games…so no sweat. Thank you fir sharing your experience…in 2008 my husband and I had never heard of this condition and our Dr’s weren’t much help. I’m glad your son and family are well.